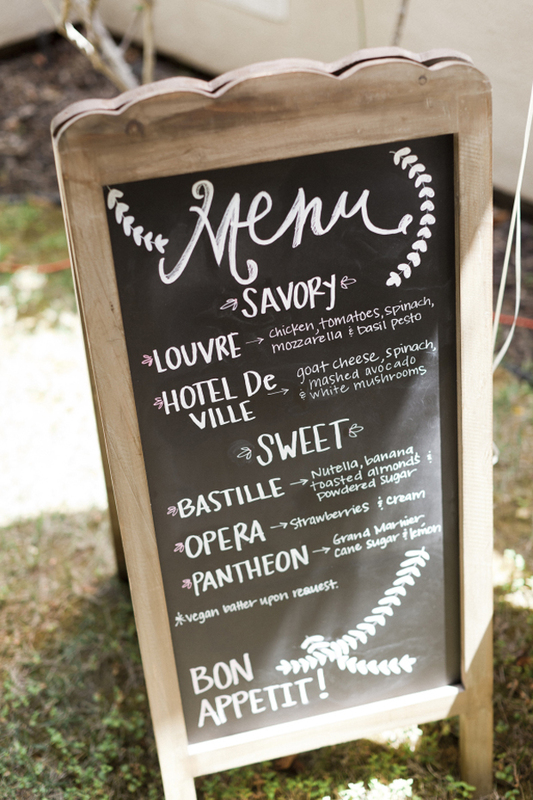 7 Food & Drinks Stations Guests Will Flock to! 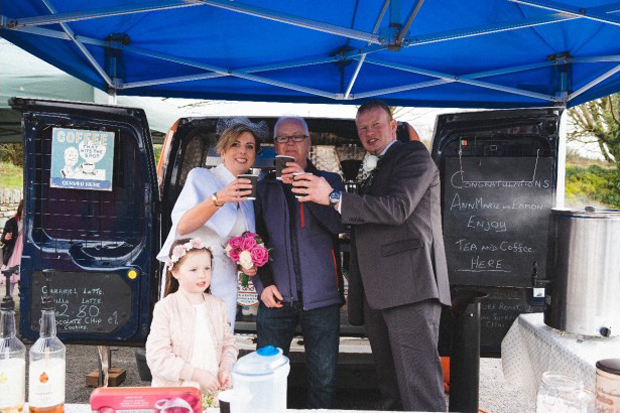 If you’re looking to fill that post-ceremony lull as guests chat or treat them to a little pick me up for the drive to the reception, a coffee will go down a treat! Bean & Gone is a mobile coffee bar that can serve up luxurious lattes and cappuccinos and all manner of other tasty hot drinks! 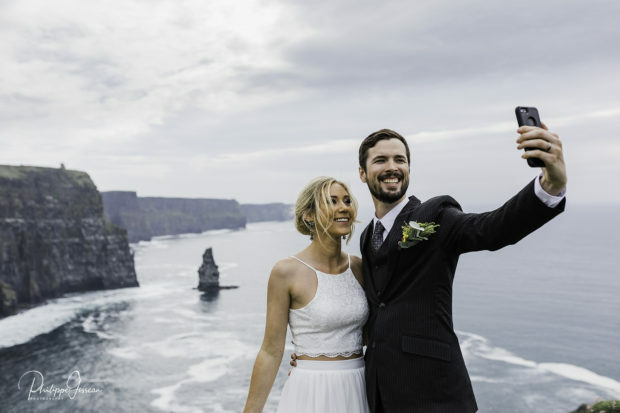 Based in Cork, it can set up at any location and guests will only be too delighted to find a warm coffee waiting for them when they make their way outside the ceremony. Find out more here. If you’re after a seriously sweet treat for guests, Crêpes and Craic is the perfect solution. They can serve up homemade Breton crêpes freshly prepared with un petit peu of craic with a choice of yummy toppings! They can cater indoors or outdoors and can set up outside the church with cocktail crêpes or can serve up crêpes at the drinks reception, dessert, as a late night snack or even on Day 2! Their menu has something for everyone with sweet and savoury varieties including Nutella with Roasted Hazelnuts or Goat’s Cheese & Ratatouille amongst others! Find out more here. If you’re looking to bring some vintage flair to your celebrations, feast your eyes on Mae! Mae is an adorable restored 70s mobile cafe/bar available for hire from Vintage Vanp. Mae comes with her own waiting staff and can pull up at your ceremony and warm everyone up with hot drinks or can be a fabulous feature at your drinks reception serving up everything from cocktails to champers or even afternoon tea (yes please to warm scones and toasty hot chocolates come winter). Guests are sure to want a pic with her too! Find out more here. Prosecco on tap? We are loving this genius idea! 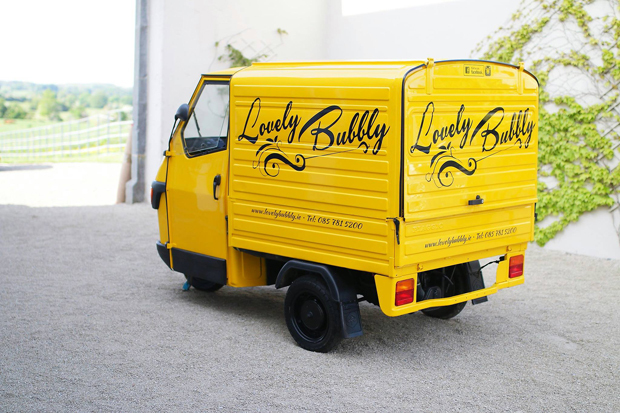 Lovely Bubbly is a seriously stylish pop-up Prosecco van complete with red carpet and its own waiter/waitress to serve guests – they can provide tunes too to add to the party atmosphere! Served with strawberries in real glasses, the van also comes with its own Pimp your Prosecco table! 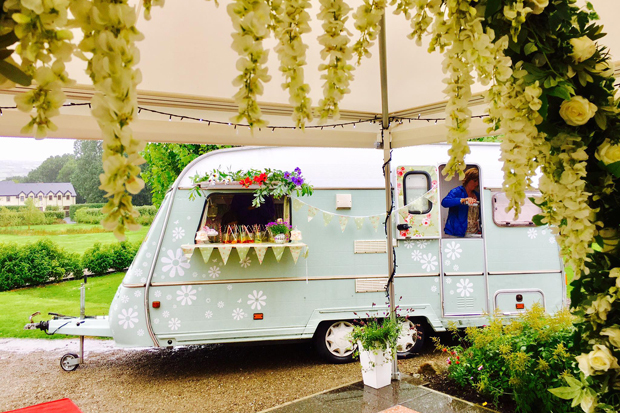 Your guests will love stopping by for refills and are sure to want a snap at this adorable van too. 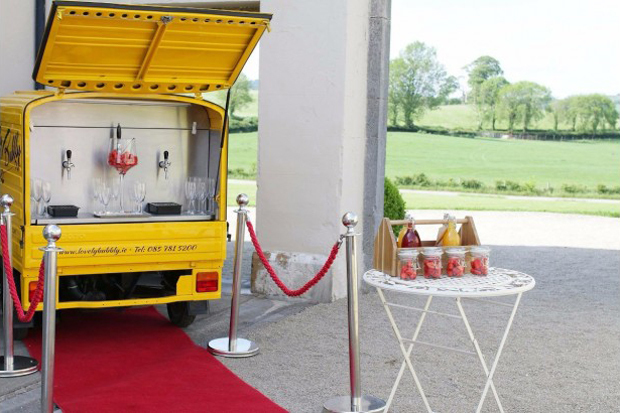 They can cater for large and small events and service most of Ireland. Find out more here. Couples looking for something a little bit different to late night sambos are loving the food truck trend – they’re massive at the mo and are a big hit with guests craving a bit of a midnight feast after a few hours on the dance floor! The Food Truck is the answer to many hungry guests prayers – this fun food truck can pull up later in the evening and dole out chip chop faves such as juicy burgers and hot dogs, onion rings, battered cod, and all manner of chips including smothered in curry sauce or yummy garlic and cheese. Watch the queues form fast! Find out more here. The stylish 50s vintage Airstream trailer would be right at home on the set of Mad Men but can, in fact, be hired for your Big Day if you’re looking to give your evening a retro twist! Adventure Catering currently has 2 stunning retro American Airstream catering trailers (one big and one small), both with that wow factor! They can serve everything from gourmet slider burgers and fries to Prosecco or it could act as your very own Gin Bar. Guests are sure to be impressed whatever you use it for! Find out more here. P.S. 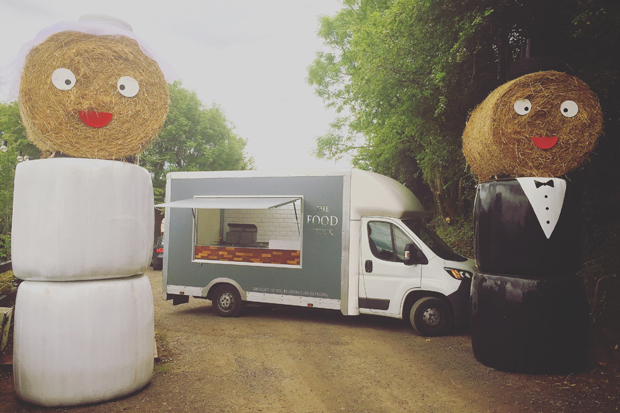 The folks behind The Airstream and The Food Truck can also serve up gourmet streetfood canapés if you’re after something different and they’re the guys behind PigOut.ie too, specialising in delicious BBQs, Pig Roasts, Lamb Roasts and Rotisserie Chicken and sides. Nom! 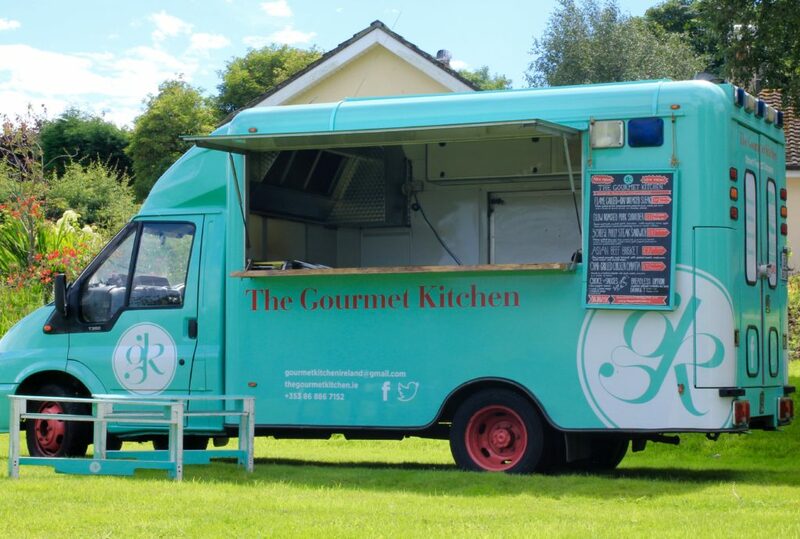 Chef and owner Liam Prenderville turned a retired ambulance into a fun truck – The Gourmet Kitchen. 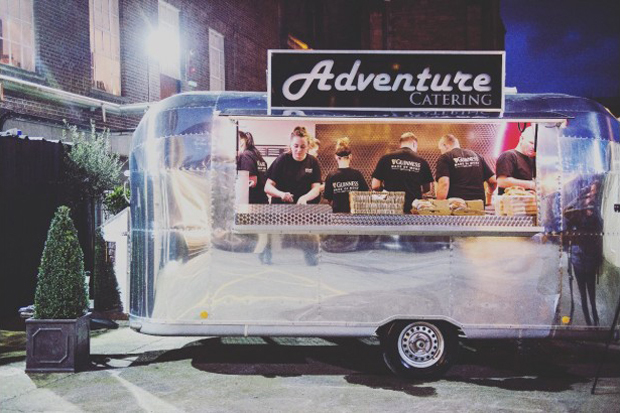 This vintage style food truck can cater for many aspects of your wedding from street food canapes to the main event – their BBQ feast is a big hit as is their shared wedding feast which is served on platters to the table to be shared amongst the guests! Their Day 2 brunches are also incredibly popular – the perfect send-off for hungry guests the morning after! Find out more here.